The Marie-Josée Kravis Prize for New Music at the New York Philharmonic is awarded to a composer for extraordinary artistic endeavor in the field of new music. The Prize consists of $200,000 and a commission for the New York Philharmonic. The Orchestra also names a Kravis Emerging Composer, who receives a $50,000 stipend and a commission. The combined award of $250,000 is among the largest new-music prizes in the world. On October 11, 2018, The Marie-Josée Kravis Prize for New Music at the New York Philharmonic was awarded to South Korean composer Unsuk Chin. Ms. Chin’s new orchestral work will receive its World Premiere by the Philharmonic in a future season. The New York Philharmonic has performed three works by Unsuk Chin, beginning in April 2013 with the well-received US Premiere of Gougalōn: Scenes from a Street Theater, named one of New York magazine’s “10 Best Classical Performances of the Year.” This performance prompted the Philharmonic to co-commission her Clarinet Concerto, which Kari Kriikku performed with the Philharmonic in its US Premiere at the 2014–15 opening subscription program. The Philharmonic co-presented her Fantaisie mécanique at the 2016 NY PHIL BIENNIAL, when it was performed by the Ensemble of the Lucerne Festival Alumni. On October 18–19 and 22, 2019, the Philharmonic will perform Unsuk Chin’s Sheng Concerto, with Wu Wei as soloist, conducted by Susanna Mälkki. In addition, Unsuk Chin is one of 19 women composers the Philharmonic is commissioning under Project 19, a multi-season initiative marking the centennial of the ratification of the 19th Amendment, which granted equal voting rights to women. Unsuk Chin was born in 1961 and has lived in Germany since 1985. She studied with Sukhi Kang in Seoul and with György Ligeti in Hamburg. Her music has attracted the attention of international conductors including Simon Rattle, Esa-Pekka Salonen, Kent Nagano, Gustavo Dudamel, Alan Gilbert, Myung-Whun Chung, Susanna Mälkki, David Robertson, Jukka-Pekka Saraste, Leif Segerstam, Markus Stenz, Hannu Lintu, Peter Eötvös, Jakub Hrůša, George Benjamin, Marc Albrecht, Kazushi Ono, and François-Xavier Roth. Ms. Chin’s career has been celebrated with a series of new-music awards, which so far include the 1985 Gaudeamus Award, the 2004 Grawemeyer Award for Music Composition for her Violin Concerto, the 2005 Arnold Schoenberg Prize, the 2010 Prince Pierre Foundation Music Award, the 2012 Ho-Am Prize, the 2017 Wihuri Sibelius Prize, and, now, The Marie-Josée Kravis Prize for New Music at the New York Philharmonic. She has been composer-in-residence of the Lucerne Festival, Festival d’Automne, Stockholm International Composer Festival, Deutsches Symphonie-Orchester Berlin, Cologne Philharmonic’s Eight Bridges festival, São Paulo Symphony, Casa da Música, BBC Symphony’s Total Immersion Festival, Melbourne Symphony, Seoul Philharmonic Orchestra, and many others. In 2007 Ms. Chin’s first opera, Alice in Wonderland, received its World Premiere at the Bavarian Staatsoper, opening the Munich Opera Festival. Portrait CDs and DVDs of Ms. Chin’s music have appeared on the Deutsche Grammophon, Kairos, Unitel, and Analekta labels. Regularly commissioned by leading performing organizations around the world, her music has been performed by the New York Philharmonic, Berlin Philharmonic, Philharmonia Orchestra, Chicago Symphony Orchestra, Leipzig Gewandhaus Orchestra, London Philharmonic Orchestra, Los Angeles Philharmonic, BBC Symphony Orchestra, Boston Symphony Orchestra, Orchestre Philharmonique de Radio France, Royal Stockholm Philharmonic, and Tokyo Symphony Orchestra, among others. Unsuk Chin has also been active as a concert curator, overseeing the Seoul Philharmonic Orchestra’s Ars Nova series (which she founded) from 2006 to 2017 and serving as artistic director of the Music of Today series at London’s Philharmonia Orchestra since 2011. Her works are published exclusively by Boosey & Hawkes. 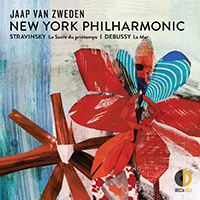 In October 2018 Jaap van Zweden and the New York Philharmonic gave the World Premiere of Agamemnon, the new orchestral work that Louis Andriessen composed upon being named the recipient of The Marie-Josée Kravis Prize for New Music at the New York Philharmonic, in 2016. Louis Andriessen has been a major influence on today’s composers, including Julia Wolfe, Derek Bermel, and Missy Mazzoli, all of whom have been involved in the Philharmonic’s new-music initiatives. The New York Philharmonic performed the New York Premiere of Louis Andriessen’s De Staat in May 1986, led by Gunther Schuller, as part of the Orchestra’s new-music series Horizons. On June 11, 2014, then Music Director Alan Gilbert took the stage to announce that Per Nørgård was the next recipient of The Marie-Josée Kravis Prize for New Music at the New York Philharmonic. The New York Philharmonic gave the US Premiere of Mr. Nørgård’s Symphony No. 3 in 2016, during the second NY PHIL BIENNIAL. This followed a performance by Philharmonic musicians of Mr. Nørgård’s music as part of the Orchestra’s new-music series CONTACT! in a program featuring contemporary Nordic composers, March 7, 2015, conducted by then Music Director Alan Gilbert at The Metropolitan Museum of Art. Per Nørgård shared the proceeds of his award with his former student and fellow Danish composer Bent Sørensen, whose Evening Land the Philharmonic premiered in November 2017, led by Edo de Waart. On December 7, 2011, then Music Director Alan Gilbert named Henri Dutilleux the inaugural recipient of The Marie-Josée Kravis Prize for New Music at the New York Philharmonic. Mr. Dutilleux made the generous decision to share the proceeds of his prize with Anthony Cheung, Peter Eötvös, and Franck Krawczyk, each of whom would write a work to be performed by the Orchestra in his honor. Mr. Cheung’s resulting work, Lyra, was premiered in June 2014. Mr. Eötvös’s Senza sangue received its World Premiere in Cologne, Germany, on the Orchestra’s EUROPE / SPRING 2015 tour, and its U.S. Premiere in New York City in May 2015. Mr. Krawczyk’s Après was premiered in April 2016. Along with The Kravis Prize, the Orchestra has previously named two Kravis Emerging Composers, who receive a $50,000 stipend and a commission. Sean Shepherd was named the inaugural Kravis Emerging Composer in June 2012, which led to the commission and premiere of Songs in June 2014, led by Alan Gilbert. Anna Thorvaldsdottir was named the second Kravis Emerging Composer in June 2015. A third Kravis Emerging Composer will be announced at a later date. On June 5, 2015, the New York Philharmonic announced that Anna Thorvaldsdottir would be the second Kravis Emerging Composer. Her New York Philharmonic commission, Metacosmos, received its World Premiere in April 2018, led by Esa-Pekka Salonen. Previously, in May 2017, the Orchestra performed the New York Premiere of Aeriality, led by then Music Director Alan Gilbert. Anna Thorvaldsdottir is one of 19 women composers the Philharmonic is commissioning under Project 19, a multi-season initiative marking the centennial of the ratification of the 19th Amendment, which granted equal voting rights to women. Sean Shepherd was named the inaugural Kravis Emerging Composer in June 2012. His tenure led to the composition of Songs, which the Philharmonic premiered in June 2014, led by then Music Director Alan Gilbert, the work’s dedicatee. The New York Philharmonic first performed music by Mr. Shepherd in April 2010, when Gilbert led the World Premiere of These Particular Circumstances in the inaugural season of the CONTACT! new-music series. Shepherd’s wideOPENwide was premiered at the second NY PHIL BIENNIAL in May–June 2016 as part of violinist Jennifer Koh’s Shared Madness program, co-presented by the Philharmonic. Funding for The Kravis Prize for New Music comes from a $10 million gift given to the New York Philharmonic in 2009 by Henry R. Kravis in honor of his wife, Marie-Josée, for whom the prize is named. The Prize: The Prize consists of $200,000 and a commission for the New York Philharmonic. The Orchestra also names a Kravis Emerging Composer, who receives a $50,000 stipend and a commission. The combined award of $250,000 is among the largest new-music prizes in the world. Henry and Marie-Josée Kravis: Henry and Marie-Josée Kravis have long been generous supporters of new music at the New York Philharmonic. In 2009 they made a gift of $10 million to the Orchestra, which has funded The Marie-Josée Kravis Prize for New Music at the New York Philharmonic; the Kravis Nightcap series, inaugurated in the 2018–19 season; The Marie-Josée Kravis Creative Partner position, also inaugurated this season by Nadia Sirota; and The Marie-Josée Kravis Composer-in-Residence position. This gift supported the commissioning of Louis Andriessen’s Agamemnon (October 2018); Anna Thorvaldsdottir’s Metacosmos (April 2018); Bent Sørensen’s Evening Land (November 2017); Franck Krawczyk’s Après (April 2016); Peter Eötvös’s Senza sangue (May 2015); Christopher Rouse’s Thunderstuck (October 2014); Sean Shepherd’s Songs (June 2014); Anthony Cheung’s Lyra (June 2014); Christopher Rouse’s Symphony No. 4 (June 2014) and Prospero’s Rooms (April 2013); and Magnus Lindberg’s Piano Concerto No. 2, written for Yefim Bronfman (May 2012), Al Largo (June 2010), Souvenir (in memoriam Gérard Grisey) (November 2010), and EXPO (September 2009). Before extending this gift, Mr. and Mrs. Kravis supported the Philharmonic’s commissioning / co-commissioning of six compositions: Peter Lieberson’s The World in Flower (May 2009); Marc Neikrug’s Quintessence (March 2008); Bernard Rands’s CHAINS LIKE THE SEA (October 2008); Esa-Pekka Salonen’s Piano Concerto (February 2007); Augusta Read Thomas’s Gathering Paradise, Emily Dickinson Settings for Soprano and Orchestra (September 2004); and Stephen Hartke’s Symphony No. 3 (September 2003).